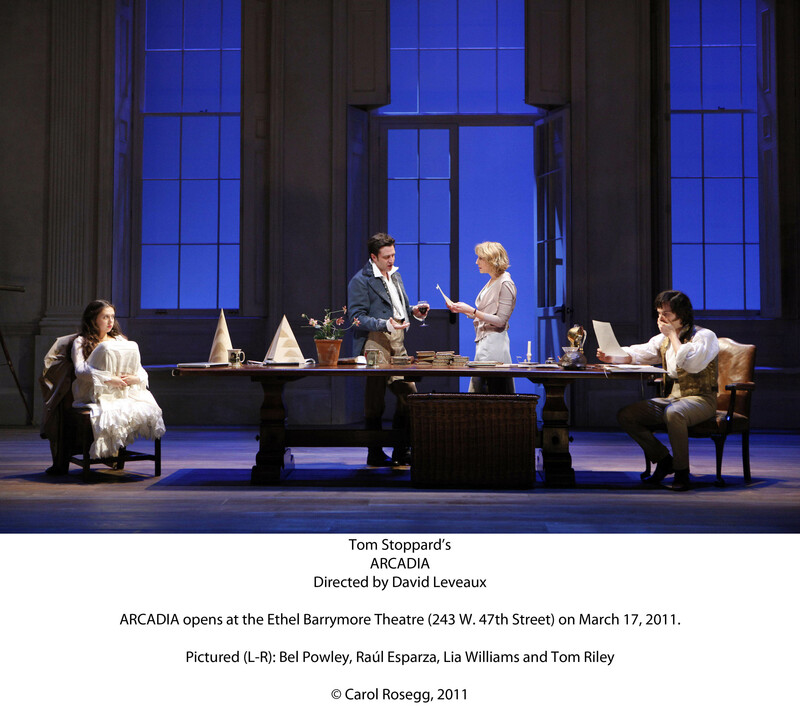 Arcadia may be Stoppard’s masterpiece – pregnant with convictions, brimming with life but not intended for the faint of heart. And not, apparently, for director David Leveaux, whose Broadway revival of Arcadia is apt to confound rather than to clarify. Clearly Leveaux has a thing for Stoppard: He has also directed flashy revivals of The Real Thing and Jumpers on Broadway and in London. But every time, the resulting production has left me cold. This time the elements seem to be there – the gifted Broadway actors (Billy Crudup, Raύl Esparza, Lia Williams, Margaret Colin), the new faces (especially British actor Bel Powley as Thomasina Coverly, the adolescent genius). Light pours in on Hildegard Bechtler’s grand country-house set, its giant windows facing the wide English sky (the lighting is by Donald Holder), and even the tortoise Plautus (or Lightning, as he’s called later) has plenty of style. But Leveaux has no gift for bringing together the two parts of Stoppard’s wide-ranging story – one section set mostly in 1809 and the second – with, of course, an entirely different set of characters – in 1993. Too often, especially late in the play, the two sections swirl around each other with no hint of coherence, and that sense of confusion is only compounded by a dense, brilliant but often confounding script. It doesn’t help that the casting can be odd: Esparza, who is 40, plays a graduate student and brother to the character played by Grace Gummer (25, playing 18) and the teenage newcomer Noah Robbins. All three are fine (and Esparza terrific), but they’re so different in age and appearance that it’s nearly impossible to keep them related in your head. The residents of Sidley Park, both past and present, are caught up in Stoppard’s exchange of ideas and in links to each other that most of them will never understand. Thomasina’s mother, Lady Croom (Colin), is preoccupied with having the grounds of her estate made over from the old-fashioned classical English manner to the newly modish romantic style, while Thomasina herself – 13 and brilliant – is engaged in the opposite task, in her mathematics studies, of making order from chaos. Her tutor, Septimus Hodge (Tom Riley), has gotten himself embroiled in all manner of carnal chaos, but he’s most preoccupied with trying to keep up with Thomasina as her mind races hundreds of miles ahead. Meanwhile, a family of 20th-century Coverlys has its own concerns. The scholarly Valentine (Esparza) is engaging in mathematical studies of his own, while his mother entertains two guests: A scholar named Hannah Jarvis (Williams), who is preoccupied with the so-called “Sidley hermit” and the death of the romantic imagination, and a showboating academic named Bernard Nightingale (Crudup), intent on making his name with claims that Lord Byron killed a man on the Coverly estate. Hannah sees the change in the landscape of Sidley Park as the decline in the imagination from thinking to feeling. And Bernard is the classic case: He’s not interested in proving what Byron did at Sidley Park, only in getting plenty of publicity for what the poet might have done. It’s all as heady a stew as Stoppard has ever created: “It’s the best possible time to be alive,” says Esparza’s character, “when almost everything you thought you knew is wrong.” But Leveaux undercuts the playwright time and time again, and especially with Crudup’s character, whom the actor plays as if he’s channeling Kevin Kline in A Fish Called Wanda – oily, mean-spirited and so thrilled with himself that he can’t suppress a self-satisfied giggle. It’s a tremendously funny performance (Crudup is nominated for a Tony), but it’s so much showier than anything else onstage that it’s exhausting, and it distracts from the matters at hand. When a teenager in a play can work herself into tears because of the burning of the library in ancient Alexandria, and when her elders are obsessed with making order of the world, one silly professor can become a little much. “It’s wanting to know that makes us matter,” says Hannah. Too bad Leveaux couldn’t let the audience in on that wonder. Where: Ethel Barrymore Theater, 243 W. 47th St., New York City. When: 7 p.m. Tuesdays and Thursdays, 8 p.m. Wednesdays, Fridays and Saturdays, 2 p.m. Wednesdays and Saturdays, 3 p.m. Sundays, through June 19. Running time: Two hours 45 minutes, with one intermission. 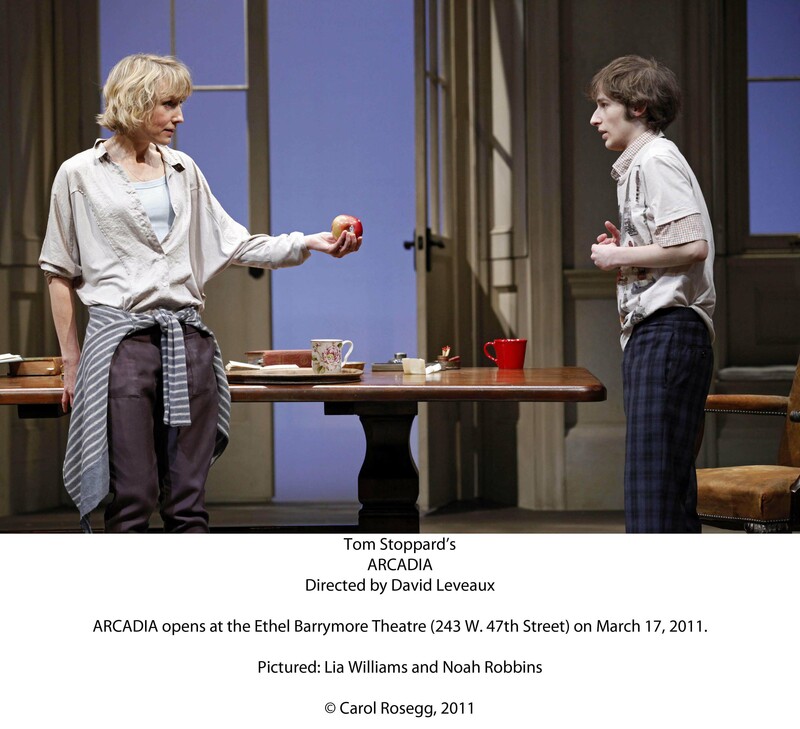 This entry was posted in Broadway, New York theater, Reviews, Uncategorized and tagged Arcadia, Bel Powley, Billy Crudup, Broadway, David Leveaux, Lord Byron, Margaret Colin, New York City, Raul Esparza, Tom Stoppard. Bookmark the permalink. Elizabeth and your review is terrific! Beautifully written. Too brainy for Broadway? One wonders why they can’t do justice to Stoppard’s masterpiece. Has anyone topped Carey Perloff’s brilliant ACT production? Small wonder that Tom entrusts his work to this brilliant collaborator. Joe, you’re lucky to have all the good theater you do in San Francisco. I’ve seen Arcadia twice on Broadway, but the most satisfying production I’ve seen was in Orlando.